Today I'm sharing a guest post with you that fits very nicely with yesterday's post about decluttering. Spring cleaning is also high up on my To-Do List and once I get rid of all the clutter I'll be following these tips. How time flies – spring cleaning season is fast approaching once again! If those two words tend to fill you with dread, or you’re the type who embraces the ‘out with the old, in with the new’ spirit with gusto, read on for some top tips that will make the whole process smooth sailing – and maybe even enjoyable. Choose one room or one part of a room and make that your goal. Don’t flit from one job to another, instead try to focus on completing one task before moving onto another. This will prevent unfinished jobs and that feeling of dissatisfaction or an overwhelming workload. Taking a step back and admiring a completed area or room will fill you with pride and fulfilment and spur you on to the next stage. Keep this phrase in mind when you set about your day. Work in a methodical way that takes you from the top down, and moving from inside to outside areas. This means you’re less likely to make a mess of areas you’ve already cleaned – which can be very annoying and disheartening. You’re guaranteed to be throwing a few things out or rearranging storage. Don’t waste time and energy making trips back and forth to bins so, setting up make shift areas of things you plan to chuck and make piles of items you’ll be moving into new rooms. This way you’ll reduce time spent transporting individual things around your house, instead making this a one or two trip job at the end of the day. 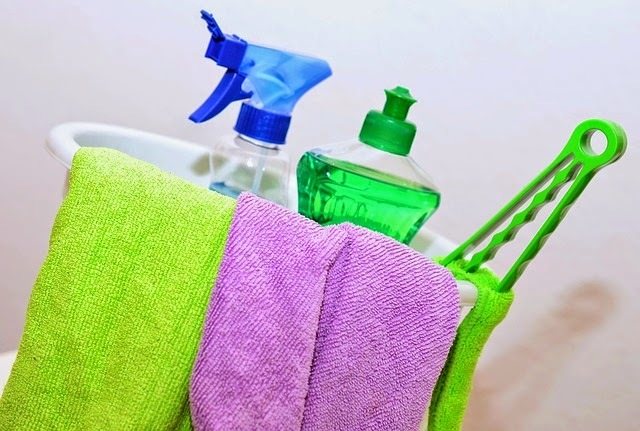 Just as many of us feel more inclined to go to the gym when we have a good set of work out gear, some nice brushes, cloths, gloves and other cleaning essentials will make a difference to your spring cleaning. They’ll hopefully be more efficient, but also more enjoyable and satisfying to use – well worth the investment. Grab a decent sized bucket and pick out the essentials that you’re likely to need from room to room, and carry them with you as you make your way around the house. This will include some basic cleaners, a sponge, gloves and dusters. Put pen to paper and write a list of your spring cleaning goals and a strict itinerary. Don’t overwhelm yourself, but be honest about how much you can achieve in, say, an afternoon. It doesn’t need to be military standard, but some level of detail is a good idea. It’s advisable to make a plan and have some realistic deadlines just to keep you in check, but sticking it up somewhere prominent will also make you less likely to give up or procrastinate. There are some good pre-made checklists and plans online, like this one for the kitchen, so have a browse if you need a push in the right direction. Perhaps you want to make some changes in the New Year; give your home a complete makeover, or even make a move into a brand new property like these new homes in Essex - here’s to a clean and organised 2015.